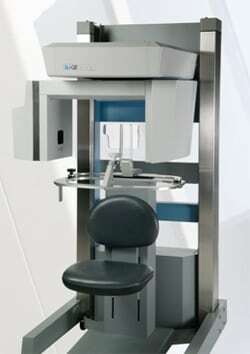 Precise, predicateble and safe Dental Implant placement. Blending innovation and patient comfort, the I-CAT Cone Beam 3-D Imaging System produces immediate three-dimensional images of patients’ critical anatomy, typically in under one minute. 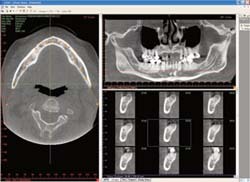 The I-CAT provides complete views of all oral and maxillofacial structures in an easy to use, cost effective, in-office system that allows us to dramatically enhance your treatment in a variety of ways. Dental implants are titanium roots placed directly into the bone of the jaw to support replacement teeth. An average sized implant is around 3.5 mm in diameter and 12 mm in length. The dentist or surgeon placing the implant needs to determine whether or not there is enough bone of adequate consistency for long-term function and stability. The images that are generated by IDT from reformatted CT scans provide exactly that information. Dental implantology holds out the promise of permanent restoration of the edentulous or partially edentulous mouth to near-original condition. It is the next best thing to “getting your own teeth back”. However, this precise and sophisticated technology requires careful planning, based on highly accurate imaging, to be effective. To be successful, implantology requires both permanent integration of the titanium fixture into the bone, and a good aesthetic restoration of the teeth and gums. Involving the implant surgeon, the restorative dentist and the dental laboratory technician in the detailed pre-operative planning is therefore extremely important. Dental implants have raised new hopes in patients who find normal dentures unacceptable or inconvenient. Biting and chewing with successful implants is the same as with normal teeth. Depending on the patient’s physical and psychological state, implants may be suitable for fully edentulous patients, or for partial edentulousness such as one or two teeth missing after trauma. Unlike conventional bridges, no natural teeth have to be destroyed during the procedure or included in the solution. In cases where the patient exhibits extreme resorption or the quantity or quality of natural bone is insufficient, bone grafts can be used to build up the implant site. Once the implant has been placed and allowed to heal, it becomes firmly embedded in the bone (a process known as osseointegration). Successful implants require a commitment to life-long maintenance both from the osseointegration team and from the patients themselves. Patients typically receive regular check-ups involving several intra-oral radiographs per year. If complications occur they are usually manifest during the first 12 months; after that complications are quite rare.